Imaging Mass Spectrometry identifies what you see at the molecular level iMScope TRIO transforms your data from just "Observation" to "Analysis"
Optical microscopes cannot determine which molecules are localized in the region of interest. On the other hand, the positional information of molecules is lost in mass spectrometric analysis, where sample extraction and homogenization is needed for sample pre-treatment. What if the qualitative analysis and localization of specific molecules and compositional and morphological observation could be obtained from a single analysis through microscope observation? 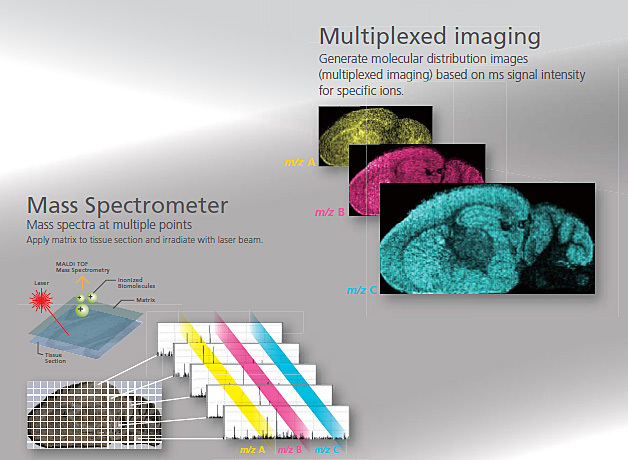 Imaging mass spectrometry with the iMScope TRIO realizes this dream.